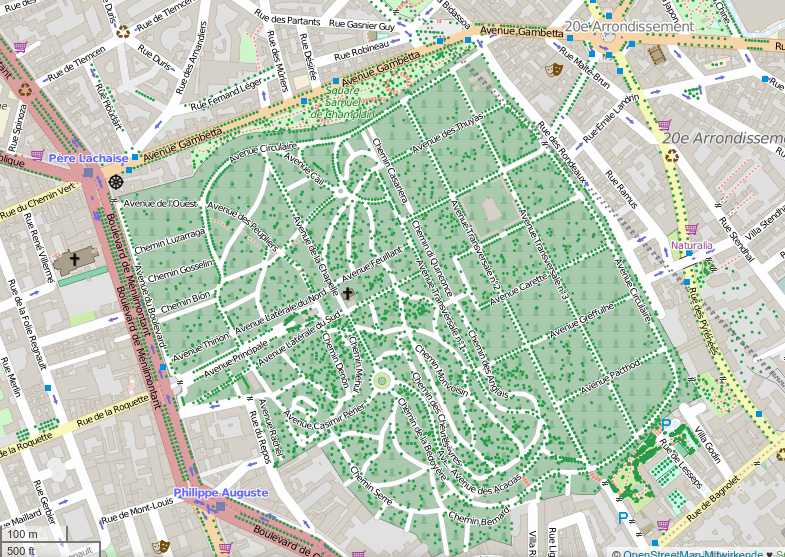 On January 25th – there will be a mapping party in Paris’s Père-Lachaise cemetery. The aim is to map the tombs of famous personalities, so that they can be used in a publication. User jgpacker draws attention to emergency routes for trucks. The creator of changesets is now automatically a subscriber in discussions on this changeset. The web service latest-changes by user: tyrasd. Display changes in OSM records within the last 7 days also offers also a link to another web service – achavi. There, the actual changes are shown in great detail. MapBox has simplified mapping, to improve OSM data on their maps. The blogger iero wants to make available a comprehensive record of the Republic of the Congo. However, he is looking for help. In the UK, mappers discover (again) the possibility of Quarterly Projects to improve OSM data. In his diary, User imagic expresses his displeasure with the proposal process, stimulating once again a discussion about how much sense voting on proposals really make. In the city of São Paulo, Brazil, on Sunday 18th January, a mapping party is taking place to map the cycling infrastructure. The city administration supports the event, which is organized by the OSM community. The program of Geospatial devroom at FOSDEM has been published. Among others, Roland Olbricht speaks about the Overpass API. Kate Chapman welcomes Cristiano Giovando as a new member of HOT . Cristiano will be focussing on a continuation of OAM (OpenAerialMap). Gregor Aisch is happy that it is finally possible, with open source software, to create maps that have a different projection to Mercator. Tom explains in reply why MapBox currently only offers Mercator maps. Following the attack on the editors of Charlie Hebdo, the French TV news channel BFM TV created on uMap a map with all the locations where protests would be taking place in the evening. UMap is hosted by osm.fr, but the site went down repeatedly because of great demand from the public. Thanks to the free SRTM data, MapBox could significantly improve their maps in Africa. A report (fr) on the Côte d’Ivoire (formerly Ivory Coast) from Swiss Television (RTS) believes that Open Data is an opportunity for Africa. Justin Manley has published Leaflet.toolbar, a leaflet plugin to create toolbars. OSRM has been released version 2.4. Biggest change is the use of libosmium for faster parsing of OSM data. The developers also announced that the web interface has been facelifted. Please see the link to “improve this map” in the lower right corner. Mapzen has published a comparison of several pbf parsers. Morgan Herlocker created an example app with turf. … the collection of links to OSM presentations, websites and general issues related to geography? … that OpenStreetMap is not only a map. See below the OSM ecosystem.